The island of Curacao (pronounced Cure-a-sow) is located in the southwestern Caribbean, between Aruba and Bonaire, just 35 miles north of Venezuela. The largest of the Netherlands Antilles, it is 38 miles long and between two and 8 miles wide. Arid by Caribbean standards, Curacao has been somewhat untouched by tourism. First discovered by Europeans in 1499, the Dutch eventually took possession of Curacao in 1634. Curacao's deep port and protected shores made it attractive for Dutch commerce, including slave trade. Today Curacao's capital, Willemstad, is bustling with commerce and has been added to UNESCO's list of World Heritage Sites. Family adventure abounds on Curacao. Historical buildings, varied cultures, pristine beaches and abundant sports activities make it attractive for family vacation adventure. Join us as we explore some incredible beaches, snorkeling adventures, family resorts and dining adventures, and more. Curacao - "Real. Different." Curacao: Facts, Tips & Fundamentals here. 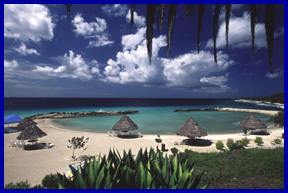 Curacao: Family Adventures & Activities here. Curacao: Breezes Lodging Review here. Curacao: Adventures in Dining here.